We feel blessed and want to be a blessing to others. We want our lives to be marked by the sacrificial love we’ve found in Christ. Aaron was born in Green Bay as a die-hard Packer Fan – it was (and is) his birthright. His family moved around the United States (and Canada) 18 times before he turned 18. He attended North Central University in Minneapolis where he met the love of his life, Krista, and started Venture, a nonprofit that spends its greatest energies on the world’s greatest needs. Aaron developed a heart to serve stateless people in Southeast Asia on his many trips to visit Krista’s family in Thailand and through his work with Venture. Krista spent her childhood in Murderapolis. She loved God and people passionately from an early age. At age 12 she moved to Thailand. 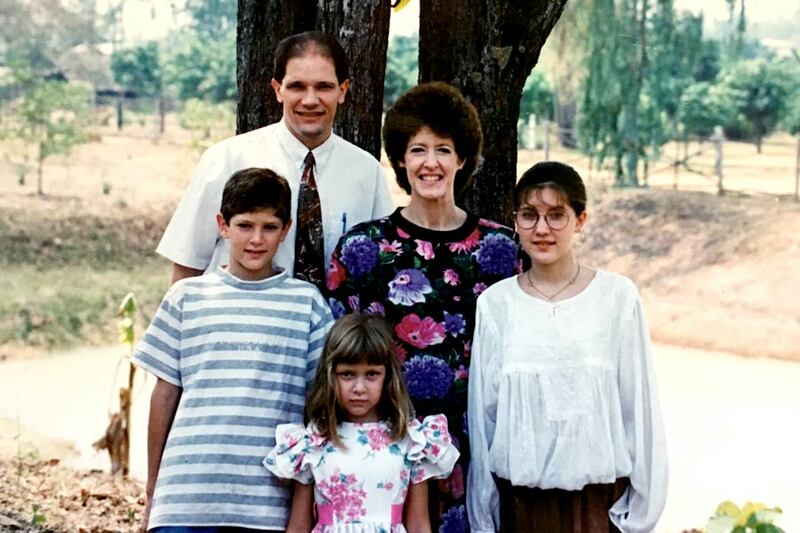 It was rough at first (see Durene family missionary photo), but after a few years, she grew to love it. She moved back to Minnesota to attend North Central University in Minneapolis where she met Aaron. She has spent most of her married years staying home with their kids, cooking, and cleaning. Her favorite topics of discussion are movies, shows, books worth reading, English, New York City, spirituality, and healthy living. Alaithia developed her adventurous spirit on her three trips to Thailand to serve and visit her grandma and grandpa. As an eight-year-old girl, she loves her friends and is very athletic and creative. In Thailand she will enjoy new things, but will miss her life in the states. Her parents promised her a dog when she moved to Thailand, so life in Thailand will be okay. Jotham has real super powers – in his imagination. He is super creative and loves to write books (request a book from Jotham). Jotham is anxious about moving to Thailand, but is looking forward to riding elephants, starting full-time school and spending time with his Nina and Bopa (Grandma and Grandpa). Take a few minutes to read our story as it pertains to Thailand. We’ve talked and prayed about it for 11 years and finally feel the time is right. We want to see Venture grow in Southeast Asia and feel like we can help. We have family currently serving as missionaries in Thailand for 20 years. Krista spent some of her childhood there and is familiar with the language and culture. There are many people there who have never heard the Gospel. We want to sacrifice on behalf of those in need.